In the last few months, WhatsApp has gone through some major privacy and security updates. WhatsApp has launched a new privacy update or new feature to stop people adding you to WhatsApp group without your permission. This news privacy update feature is available in the latest version of WhatsApp. Still, now anyone can add you to any WhatsApp group unless you haven’t blocked him/her. This is very awkward that you woke in the morning and you have found yourself in some not relevant WhatsApp group added by some unknown number and your phone keeps ringing due to the chaos in that particular WhatsApp group. In a country like India and Brazil where WhatsApp is used as a major communication medium and also it takes a key role to play spread fake news and viral content. This is very unfortunate that’s why WhatsApp has drawn a limit to forward a message. Now you can’t forward a message to all your contacts in a row. If you select Nobody then none can add you any WhatsApp group. Once you have selected your desired privacy for Group just hit green done button. Now you have turned on group privacy settings for WhatsApp Group. 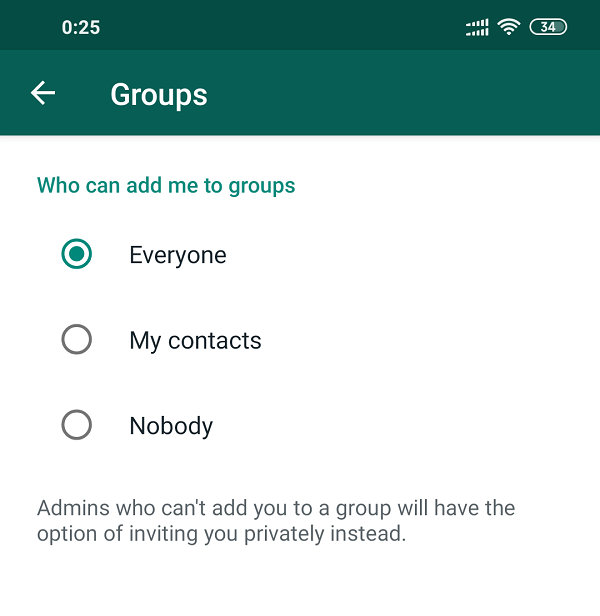 Here WhatsApp has also added a nice option that if some WhatsApp group admin tries to add in their WhatsApp group then you will receive an invitation to join the Group via a private message. This is pretty much neat a clean feature WhatsApp has introduced in their new updated version of WhatsApp. If you hate adding yourself adding in random WhatsApp group then you should enable this feature now. This is a very nice privacy feature in terms or WhatsApp group growing like a mushroom and keeping yourself safe from a poisonous one.